The "50th Anniversary Ultimate Collector's Edition" of Ben-Hur is available today only from Amazon at 55% off, $28.99. Not a bad film to watch during the Easter season. This is the restored Blu-ray version of the film and probably a better viewing experience than I had at the theater in Janesville in 1959 [I'm sure the sound is better]. If you ever considered owning the film, this is a bargain. A link is here [and if you buy through this link I profit, too]. High-definition Blu-ray hits greater heights with the arrival of the visual splendor, thundering action and towering drama of this record-setting winner of 11 Academy Awards® including Best Picture. 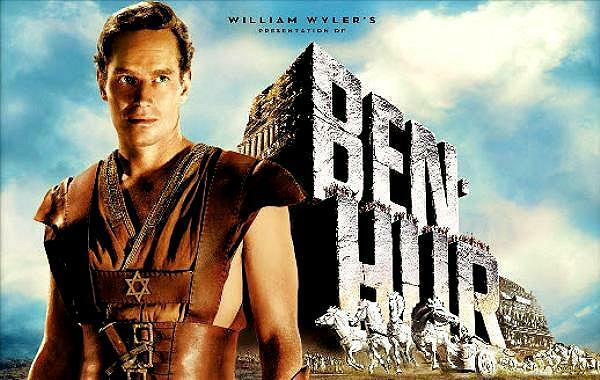 Charlton Heston brings a muscular physical and moral presence to his Best Actor Oscar®-winning role of Judah Ben-Hur, a Jewish nobleman in Palestine whose heroic odyssey includes enslavement by the Romans, vengeance against his tormentors during a furious arena chariot race and fateful encounters with Jesus Christ. Best Director Oscar® winner William Wyler masterfully grips the reins of an enduring and spellbinding spectacular.